During the summer, Colgate students are applying their liberal arts know-how in a variety of real-world settings, and they are keeping our community posted on their progress. 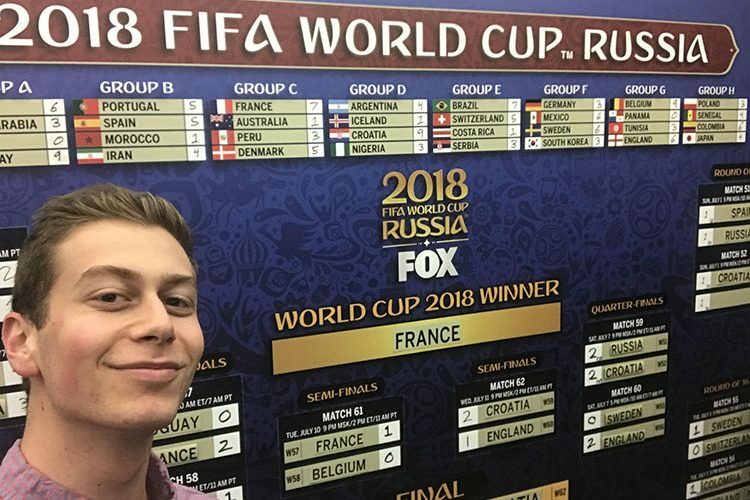 Peace and conflict studies major Theo Asher ’20, from Los Angeles, Calif., writes on his summer internship as social media production intern at FOX Sports during the recent World Cup. This summer, my work has primarily focused on FOX’s cross-platform coverage of the 2018 FIFA World Cup. The World Cup is the largest global athletic spectacle — every four years, billions of viewers tune in to watch the world’s elite soccer players represent their nations in fierce and emotional competition. Contributing to this enormous operation has been an eye-opening and profoundly joyous experience, one that has taught me not only about the game of soccer but also about myself as a young professional in the sports media industry. I have been a ravenous consumer of sports data and information throughout my entire life. Early in high school, I discovered a passion for storytelling in the context of professional sports. I have had a variety of enriching experiences since then, including the opportunity to volunteer for the Special Olympics World Games in 2015 and to intern in television production with the NFL in 2017. Experiencing FOX’s production of the World Cup was one of the most thrilling endeavors of my professional life. Just as each player on the soccer pitch has many responsibilities to execute, I have performed a variety of functions as social media production intern. During the tournament, I assisted producers in the digital media hub by clipping live broadcasts and reporting on social engagement data. My most important responsibility was to assemble a highlight package of the best Instagram and Twitter fan reaction videos from the day’s action. To perform this task, I used social analysis services like Spredfast to geo-fence cities all over the world and find the best reaction videos in response to goals or other important moments of a match. Finding the most appealing content for a World Cup highlight requires a nuanced familiarity with FIFA broadcast law and firm knowledge of what reactions will be the most fascinating for soccer fanatics and novices alike. My job was to be a digital “hype man” for fans seeking to live vicariously through the buzz of cities like Zagreb, London, and Paris. Collaborating with some of the industry’s brightest minds has given me wisdom I’ll cherish for years to come, especially as sports information becomes an increasingly digital enterprise. There is a new paradigm in the sports media landscape — one predicated on the emotions of the fans, conveyed through the limitless possibilities of social media. I hope to continue to develop this affinity for sports media and push the envelope with my next opportunity.